Disjointed to a fault, in part because of the high quality of its first half. Appears in many ways to be the product of a gifted dramatic writer who was forced to write for a prompt which called for an attack by killer birds. In the end, the last hour of bird mayhem destroys most of what's great about this film -- The pacing, the complicated gender dynamics, and its most interesting character. Doomsayer in diner: "It's the end of the world"
Probably the worst paced Hitchcock I've seen yet. It is a slow burn for sure, which benefits for the scenes of tension, but outside of them the movie is quite boring. The first act of the film feels aimless as it is slow, spending nearly 25 minutes simply asking questions to get to a house. One of my new favorite scary movies. Unlike a majority of modern horror films, this lets the main characters develop a little bit and interact with each other on a level that feels personal, and quite real. The dialogue was excellent! I also found some scenes to be really damn scary, especially everything after the power outage. 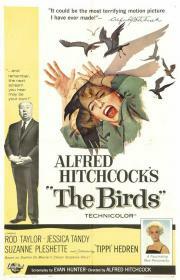 Some of the shots feel dated and cliche by now, but all in all, Hitchcock directed this very effectively. I loved what he did with the concept and story. Excellent.